A first-of-its-kind commercial supply ship rocketed toward the International Space Station following a successful liftoff early Tuesday, opening a new era of dollar-driven spaceflight. "The significance of this day cannot be overstated," said a beaming NASA Administrator Charles Bolden. "It's a great day for America. It's actually a great day for the world because there are people who thought that we had gone away, and today says, `No, we're not going away at all.'" Excellent!, this is a real turning point for space travel, I'm really impressed by the magnitude of the savings they've achieved when compared to exiting governmental organisations, go capitalism! What a gorgeous launch!! Dragon in orbit, wings deployed. Launch was OKAY. I'm a huge fan of nighttime rocket launches because they light up the whole night sky as if it were daytime for a few seconds. The Dragon launch was bright, but nowhere near as overwhelming as a NASA rocket. But, that's probably because of more up-to-date engineering and efficiency (as well different fuel) so in my mind, even though it's not as glamorous, it's certainly progress. On the 10 point scale this launch was mediocre at best. Sure, she nailed the take-off and landing but her form was sOOOooo blase'. Prior competitors utilized the oft touted roll as well as the extra bright fuel burn for that extra je ne sais quio. No style. No grace. I had a chance to watch a space shuttle launch at night once. It was amazing. I was very sad to see the program end. I was even sadder to see the VentureStar program scrapped. I agree, however, that the commercial sector is the way to move forward with space travel and exploration. Way to go SpaceX! "...NASA has contributed $381 million as seed money." This is historical. Now the private sector will show effectiveness in starch contrast to the public sector. I got up early to watch it stream live on NASA TV. I watched the attempt on Saturday too so it was especially nice to know I'll get to sleep through the night tonight. I loved watching the reactions of those on the control rooms. Witnessing that pure joy and pride made the wait completely worth it. Congratulations! A comment on the article. Is the following quote correct? I could have sworn Soyuz capsules (used for cargo all the time) routinely re-enter without a problem...not to mention they are the emergency escape pods on the ISS, correct? "This newest capsule is supposed to remain at the space station for a week before bringing back experiments and equipment. None of the other types of current cargo ships can return safely; they burn up on the way down." "Musk, a co-creator of PayPal, founded SpaceX a decade ago. He's poured millions of his own money into the company, and NASA has contributed $381 million as seed money. In all, the company has spent more than $1 billion on the effort." How much money was spent is almost irrelevant compared to hope gained for the future. Money is a symbol of work done, 'man-hours'. Work done is in the past. Hope is for what the future holds. And yet, both the past and the future are beyond our grasp, illusions even. Kudos to you Elon Musk. The sacrifices you made, make and will make make you priceless. Commercial, privitized space travel is a miracle. Paypal and the Tesla demonstrate your amazing potential (or 'luck'). I grew up reading others dreams of people living in space. I hope to live long enough to see those dreams become reality. Soyuz have very little cargo return capacity. They're used almost exclusively for human transport. What you're thinking of is the Soyuz derived automated Progress cargo vehicle. Unfortunately the Progress is *not* designed to return to Earth, and instead burns up while reentering the atmosphere. As do the Japanese and European automated cargo vehicles. Right now there is no way to get most of the experiments down from the Station. Only the shuttle could do that. And, assuming this mission goes well, the Dragon as well:). Man's ambition to grow beyond his perceived boundaries never ceases to amaze me. Way to go SpaceX and here's to a real future in space exploration. They still depend on inflated contracts from NASA. I think it can not be a true (profitable) private business without the help of public funds until they find a way to recover the rocket first stage (ideally second stage also, but optional). But I am not negative, I bet somebody will solve it. Incredible as it may seem; impressing you was not on their list of goals to accomplish with this launch. I'm happy to hear that what's left of James Doohan finally made it into space as was his dream. 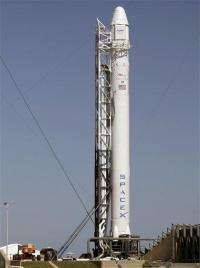 Congratulations to SpaceX, an efficient design and it only costs $200,000 to fuel the rocket to get a cargo into orbit and then reach the ISS, hope all goes well for Friday when they dock. The Progress automated docking module has had an incredible record of reliability. I was glad to see the level of confidence the ISS participants had in it early on. I hope we soon attain that level of confidence in our private manned transport vehicles. All three of your last comments sounded like religion rather than fact. Look at all those belief statements. People often misperceive facts being linked with certain causation. They see facts, and then because of neurological hardwiring automatically grasp at a particular causation because to them it can be no other answer. You must be really terrible at understanding science, and certainly not qualified to perform any. I see you live in Texas, so do I. Lets go have a beer sometime and hash this out. SpaceX is no different than any other NASA contractor. Except this contractor is fulfilling a mission rather than a sub job of a mission. That would make it historical. I bring order to chaos. The only good Libertarian is a dead Libertarian. LMAO, sounds like a good ol statist to me. A momentous occasion and truly a vindication of Capitalism. No other nation, state, or government in the history of the world has been able to foster an atmosphere that would allow for such a tremendous undertaking by the private sector. This just goes to show that when left to it's devices Capitalism can promote and provide the means for people with good ideas, no matter how large or small, to make them reality. Soyuz is a crew spacecraft, not a cargo spacecraft. Its cargo capability is very limited. The current batch of cargo spacecraft going to ISS are Progress (a non-crew Soyuz), ATV (Europe) and HTV (Japan), all of which are one-way and burn up on re-entry. The Orbital Cygnus, another COTS commercial cargo carrier, is also one-way and has not flown yet. Its debut flight has been delayed until late this year. Dragon will be the only cargo carrier to have down-mass capability, up to 3 metric tons of it, and it is also to be evolved into DragonRider - a crew spacecraft that can transport up to 7 passengers, or a mix of cargo and crew, and touch down on either land or water. Landings will eventually be propulsive using rocket thrusters. Let's be clear: SpaceX is the first private company to completely and INDEPENDENTLY self design and self build and launch a man capable, orbital rocket from the ground up without the initial sponsorship of NASA or a government agency. THAT'S what makes them different. No other private company has ever done that. I'm getting a little tired of people saying other "private companies" built all our other rockets. NO. While other private companies "built" ( actually mostly subcontracted) rockets, SpaceX is like the guy who went into his garage all alone when no one was looking or paying him and independently came out with a complete revolutionary car while the others are like guys who got fat contracts from the government to build cars before they even started. Also, if you read some interviews with Elon Musk, you learn that money is not his primary motivation, unlike other companies. He genuinely cares about the future of manned spaceflight, and wants to retire to Mars. People seem to forget that the billion dollars includes the development of two major rocket engines, and an escape/navigational engine plus the dragon capsule itself, not to mention two complete launch facilities and part of a third, plus all the manufacturing facilities and a full blown test and engine development facility. All of that has been done for less than what the gov pays each year for one "heavy-lift" vehicle from one of the current clowns. If Musk had one of those cost-plus contracts, he'd be able to run one of the richest IPO's of all time. And, there will be no heavy-lift vehicle from NASA; they won't have the budget for it. Musk will again come to the rescue with the F9 Heavy, capable of putting anything we actually need into space. To quote a line from the movie: "Jurassic Park"....'You stood on the shoulders of giants, and took the next step..!' Most of this tech WAS originally researched and some actually made by government scientists, many of whom work or worked for Mr Musk in his 'private' endeavor. Of course the government research that went into this, and the government workers now working for this whe gave their ideas formed over decades of experience...will now become part of a body of 'original intellectuoooal property' to be sued over for the next hundred yearsssss by press gangs of lawyers and bean counters (like Steve Jobs the thief of the 'Woz's Apple computer) who contributed nothing but will steal it all. A little closer to home, this Falcon9 IS like Buzz Aldrin's 'StarCORE' that he wrote about in a book many years ago. A 'big dumb booster' that is expendable and cheap, and one that can be combined like the proposed F9-heavy to do bigger jobs and reduce access to space cost further. Cost is the bottom line in space for both governmental and private actors. Of course the space elevator would be the ultimate cost reduction. But then so would a hydrino rocket/one stage to space shuttle. Musk's people are to be commended on bringing again American know how to do a job. Just hope he does not sell out to the Chinese. Private individual! He could, you know. Vendicar, you could learn a lot from ShotmanMaslo. This was the first time a space craft designed, built, and launched by a private entity was put into orbit around the Earth. No economic system other than capitalism could have made this possible. Capitalism provides the incentive to take such risks, in the form of potential for profit. You don't think SpaceX is going to be servicing the ISS or placing satellites in orbit for free do you? No, they will be paid, and eventually they will turn a profit, and if that wasn't possible then their would have been no incentive to do any of this. This is nothing new, most of your modern life can be attributed to capitalist profit motivation. Do you think drug companies would spend billions on research and development if they couldn't charge a fair price for the medicine the develop? If it wasn't for capitalism you wouldn't have most of the things that exist today. Vendicar: Capitalism Fails? Hmm... maybe, but until then i want to get rich. So you may want to buy some stocks with a profitable space company. Let's be clear: SpaceX is the first private company to completely and INDEPENDENTLY self design and self build and launch a man capable, orbital rocket from the ground up without the initial sponsorship of NASA..
No way, they're not that dumb, romantic or lack good sense. Do you think NASA's management would be ok to risk a billion & leave it all up to a startup with negligible history & minimal finance in aerospace terms ? Not at all ! NASA laid long term groundwork; combinatorial experience, various research, data & design permutations of *decades* is part of the contractual mix under appropriate performance criteria (under confidentiality), it contributes to the success of the venture ! SpaceX has one or more ex NASA people but that's not enough, its the gestalt; research data, post mortems & decades of knowledge (also of what not to do) which is drawn upon directly to save time experimenting. One year's military budget would fund NASA for 40 years. Please watch Neil deGrasse Tyson's keynote speech last month to the 28th National Space Symposium. It is rational, inspirational and the embodiment of common sense.